The study of differential calculus is concerned with how one quantity changes in relation to another quantity. The central concept of differential calculus is the derivative. 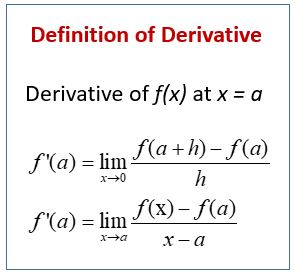 The following formulas give the Definition of Derivative. Scroll down the page for more examples and solutions. The tangent line to y = f(x) at (a, f(a)) is the line through (a, f(a)) whose slope is equal to f’(a), the derivative of f at a. This means that the derivative is the slope of a curve at a given point on the curve. Use the derivative to find the slope at any point along the following curves. The following video shows how to find the slope of a tangent line to a curve and gives the definition of a derivative.